There’s always a place for independent service in the fabric of a big town. While over the years, most OEMs have attempted to create proprietary aspects to servicing their bikes, the independents have overcome it, gaining access to exclusive testing devices and continuing the tradition of offering riders who want it - an alternative to OEM shops. Photo: Dana Marshall and Mark Eddy, the new owners of Vallantine Motor Works in Seattle. Mick Vallantine began his small independent BMW motorcycle operation out of the downstairs garage of his home in the Ballard area of Seattle several decades ago. Over the years Mick’s business grew and eventually he took a lease on a building on Seattle’s Aurora Avenue North. As Mick got on in years his knowledge and tool selection didn’t encompass the newer technology and simultaneously it was getting time to retire. 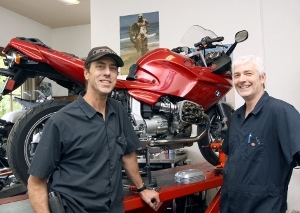 Enter Mark Eddy and Dana Marshall, two former Ride West BMW techs with more than two decades of service and training between them on more than just BMW motorcycles. In the spring of 2013, Mick brokered a deal for the pair to buy him out, staying onboard for three months through the summer to guide them through the transition. The result – same shop location with a broader ability to work on not just BMWs, but Japanese brands across the decades as well. "We are trained and capable of servicing pretty much all BMWs from vintage years, all the way up to the new water boxers,” notes Marshall as we discussed the new situation shop-side one fall afternoon. Their personal tool and gadgetry arsenal contains all they need to do just that. Sourcing parts from nearby Ride West is all part of the deal as both parties understand the need for independent service in any major market. "It’s a friendly competition and ultimately provides choice to the owner of the brand,” notes Eddy as the discussion continues. "We maintain a good relationship with the Ride West staff as well as the owners – Keith & Ann Thye." The duo is also trained in working on current Japanese brands honing that knowledge over more than two decades of teching. That knowledge comes with them to VMW. Thus an owner arriving with a modern day Yamaha, Honda, Suzuki or Kawasaki, makes it just another day at the office for the two partners. While business is typically slower during the fall and winter months, Eddy and Marshall have several plans of action. The first is to offer restoration services for the five brands they specialize in, handling all the tech work in-house and sourcing the paintwork out to Seattle’s SIK Werks paint shop in Seattle’s University District. This is typically not a service offered at current OEM shops that typically only service bikes 12 years or younger based on parts availability. For independent shops willing to spend the extra time sourcing parts via eBay and other outlets, it can be a nice pay-off during slower months. Interestingly, while Mick did a number of BMW final drive replacements over the years, he never actually split them and rebuilt them. He did however leave Eddy and Marshall with a dowry of failed final drives. The two plan to heat them up soon and rebuild each one so as to offer a low cost replacement over the expense of a new one. The pair also plan to focus more on offering services such as tires and general tune-ups in the fall and winter. Wise riders taking advantage of these options during colder months will eliminate the anguish of waiting around to get an appointment when the schedule heats up in the spring, a time most would rather be riding than waiting on a delayed new set of tires or general service. Meanwhile, with Mick happily retired, Eddy and Marshall are enjoying slipping into their new adventure providing BMW owners, as well as others, with an updated outlet for independent service in the Northwest.